I've just made a comment on Pocket Pete's Michelin pr4s woes about dealing with a puncture (Michelin Road Pilot 4 Review), and I thought why not give a short review on a fantastic product I have used several times, in the most remote places like The Alps and Spain. 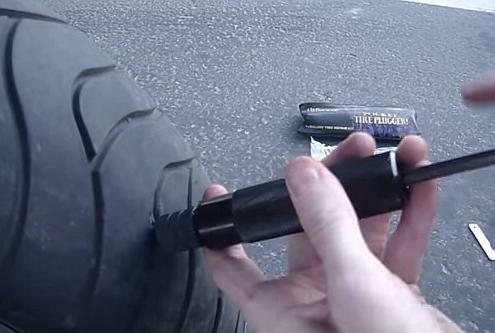 It is called 'Stop & Go Pocket Tyre Plugger' and has saved the day for me more than once. Ok so you have got a flat tyre and you are miles from home. Why call out a recovery service when you can, with the right equipment, get going again yourself in 10 minutes? Well you can quite easily with this puncture repair outfit. You do however need to locate the object that caused your tyre to lose air then just follow the instructions supplied in the kit which are as follows. That's it now inflate the tyre either with the gas canisters, or a pump. I have a compact 12 volt item from Aldi so I don't need canisters. Then simply carry on riding to your destination. 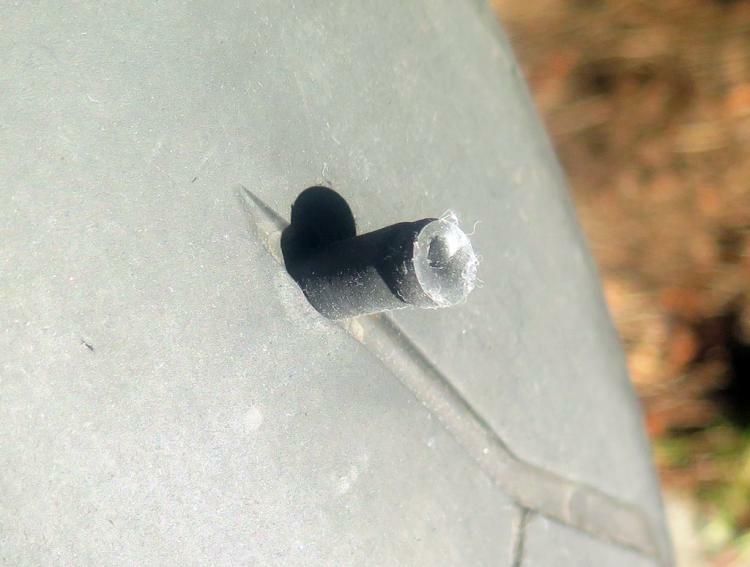 This is of course only a temporary fix and does not render your tyre useless for repair, provided the puncture is in the right position on the tyre ie near the centre. If it is too near the edge it is best to discard that tyre and obtain another in the interest of rider safety. Have a heart and try to remember us poor souls who are stuck back in the stone age with spoked wheels and inner tubes! Aaaawww CrazyFrog. 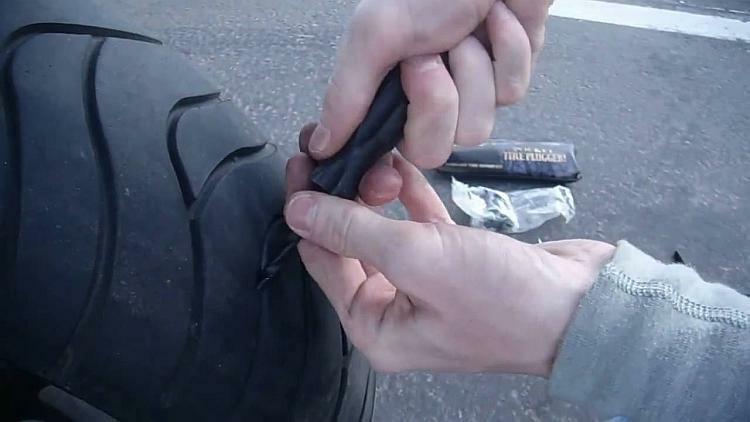 But...when you get a puncture unless the tyre is shredded then you can simply replace or even fix the inner tube. Many tyre shops will baulk at doing a puncture repair on a tubeless in case it goes wrong and they end up on the wrong side of a lawsuit. I've never actually heard of anyone being sued for a tyre repair. Similarly, I've never heard an actual documented instance of an insurance company refusing to pay out because of a non-standard part which had no relevance to a collision*. Provided the tyre repair has been carried out with due professional competence, it would be laughed out of court. *Please let me know of any actual substantiated case, not the usual urban myths. 'S funny but yeah, now I come to think of it I've never heard of anyone being sued. It's all "hearsay". I personally was told by a tyre shop that some tyre brands don't allow puncture repair in their "Z" rated tyres. Now...is this a fact...is this the tyre shop looking to increase sales rather than repairs or is my imagination remembering other rumours? Somewhere there are facts in between the opinions and outright lies. PocketPete was asking me about chains and sprockets. Some folks say replace the whole lot, some folks say only if the sprocket(s) are worn, some folks say don't lube O-ring chains, some folks say you don't need O-ring chains...and so on and so on and so on. All I could offer was my personal experience rather than facts. It certainly is a great bit of kit. Used it on my NC about 12 months ago, the bung is still there after all this time and I recon ive done around 6500 miles and its never leaked air out and ive pushed it re MPH. Ive even used it on my lads Honda civic front tyres, saved him a few bob. Two links below, first one is the standard kit and second one is for tubless and tubed tyres. I used one of those kits on a puncture in my back tyre on the way to Santa Pod back in 2001. It defo works if done properly. You see a lot of folk on t' interweb saying their piece either for or against repairing punctured tubless tyres and most of them are totally wrong. An experienced motorcycle Tyre Fitter will be able to repair the vast majority of punctures with no risk of it failing. Cheers Grav n John. Grav - 2001 - did they even have tyres back then, I seem to recall we used wooden hoops? If you have tubed tyres, it's much better to carry a spare tube than patches. Trying to find the hole then patch it while grovelling beside the road in the dark while it's pouring with rain is no fun. I know, I've tried it. Thanx to Bernard Smith I had a 1/4 inch hole plugged after a bolt was picked up on Bannock Moor Glen Coe in a rain storm. After several attempts to plug with those black furry needle type fixers. The unit B carried was easy to use and very good at repairing the hole. Having run a further 1000 miles over the following week, I can certainly state that this kit works very well. I will be getting one for certain once I find where to get it. For the record the hole was just off centre right on a tread chunk. Wouldn't that be Rannock Moor Pete? Good job Sue had the van that evening for our comfort because it wasn't the most pleasant of evenings.